Our meet-up spot was Circles Cafe in San Marcos at 2pm. The retreat didn’t start until 4pm, but we were advised against hiking to The Yoga Forest (a 20-minute climb up a mountain footpath) without a guide because muggings have been happened along Lake Atitlán’s trails. These pretty crimes are opportunistic, meaning they happen to naive foreigners willing to hand over wallets full of cash out of fright and Philipp is double the size of most Mayan men, but we didn’t want to risk it. We were also excited to meet Batya, the main coordinator and a facilitator of the retreat, and the seven others joining this transformative journey with us. They met us with smiles and we were on our way. The start of an intimate experience like this, a 7-day off-the-grid retreat in the jungle, can be a little awkward at first, but our group was quick to open up and friendships were made almost instantly. We were a diverse bunch from all parts of the world - Kaari from New Zealand, Mihai from Paris, Camila and Nicola from the UK, Holly from San Francisco, Clara from New York, Celine, a Belgian living in Guatemala, Eran and Batya, our husband and wife facilitators, from Israel, and of course us, a couple traveling full-time, most recently in Mexico City. It was magical to have this international group together for the week - we were all different, but all had the unifying intention of disconnecting from our routines and reconnecting with ourselves. The retreat was called “The Alchemy of Living” and our main focus was to rest, cleanse, and energize on all levels while gaining practical knowledge on how to live harmoniously and achieve greater well-being and balance. This came in various forms - yoga, deep relaxation, meditation, ayurvedic teachings and transformational work using guided visualizations, group process, and movement. All aspects subtlety grounding, rebalancing, reopening, and expanding us into the here and now and our greater consciousness. We didn’t know what to expect from the retreat, especially when it came to “transformational work” (Jess joked she’d transform into a butterfly by the end of the week), yet we both transformed in tiny ways and the experience far exceeded our hopes and highest expectations. 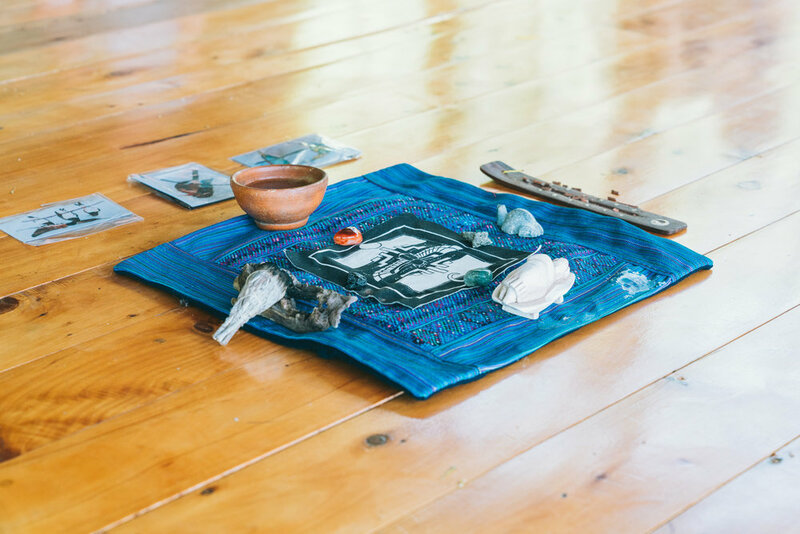 Jess walked away from it with a happy and open heart, firm grounding in Guatemala (traveling even short distances can be unsettling), and a strengthened desire to integrate ayurvedic principles into our daily lives. Philipp walked away from it with a new passion for Ayurveda (it was his first exposure to the ancient science) and a relaxed, balanced and happy mind and body. We both want to participate in another retreat like this next year, and every year, and hope the photos, highlights, and information below help inspire you to join us in the future or to visit The Yoga Forest at Lake Atitlán on your own. We started each day with Satyananda yoga & meditation guided by Eran from 7-8:30 am in a beautiful space called the Shakti Shala. The room, with warm wood floors and an unobstructed view of Lake Atitlán and Volcán Tolimán, was a magical place to warm up our bodies and welcome the new day. Our sessions, typical of Satyananda yoga, started slow and increased in intensity as we strengthened and the week progressed. We incorporated a gentle sequence of poses, breath work meditation and cleansing into our practice as we focused on bringing the whole body into balance and a state of peace. The idea and intention was to connect with our four elements (fire, water, earth, air) and awaken and cleanse our chakras through what we now know is called chakra shuddhi (chakra purification), yoga nidra (psychic sleep meditation), and naada/mantra yoga (yoga of sound and chanting). Breakfast following these morning sessions were often in silence, helping to elongate our calm meditative states. This was a relaxing retreat so the aim wasn’t to get bogged down with information but we still learned a lot from Eran on Ayurveda, “the knowledge of longevity.” He talked to us about the philosophy, cosmology, and psychology behind the science, how to think about health as a mind-body-spirit concept, and went into detail about the doshas (constitutions) that we all fall into. There are three dosha types and they relate to Earth’s elements - Vata (Air, Ether), Pitta (Fire, Water), and Kapha (Earth, Water). Everyone has all three in them, but there’s always one or two types that are more predominant and we often have imbalances related to one. For example, someone could be Pitta with a Vata imbalance (70% of imbalances these days are related to an aggravation in Vata). To achieve balance and well-being, the three main pillars of our lives - digestion, sleep, and intimacy - must be in sattvic (pure, harmonious) states. Any areas of our lifestyle and emotional states that are in rajas (overactive) or tamas (withdrawn) will lead to struggle and ultimately health issues. Ayurveda teaches us how we can be well and reach higher consciousness through diet, exercise, and detox routines based on our specific constitutions. We won’t go into more detail here about ayurvedic principles, doshas or remedies, but if you’re interested in learning more and want to familiarize yourself with the science, we encourage you to take a free dosha test like this one as a starting point. There are many nuances a simple online test won’t catch, but it’s a good starting point and means for self-reflection. We’d also be happy to share more of what we learned if you send us an email. Cacao is the “heart blood” of the indigenous Mayan people and we drank a ceremonial dose to stimulate our spiritual side, open our hearts and dive into deep inner work. We danced, made mandalas with objects found in nature, wrote love letters to ourselves and had an intense meditation session. It was awesome, heart-warming and moving. Temazcal, stone sweat lodges, are like the “womb” of the Mayan people. We gathered and had a ritual inside one, giving thanks to Mother Earth and her magical elements. We had four sweat sessions (doors) for each of the four elements (earth, water, air, and fire) and we followed each door with cold water cool-down. Sweating in the steam bath felt amazing and we all slept super well that night. The most profound meditations for us were those where Batya guided us to meet our inner subconscious selves - our Observer, Elder, and Inner Child. Our Observer is the one who’s in-tune with our emotions and knows what makes us happy, but often gets overlooked. Our wise Elder is there to teach us who to be and what to look out for and our Inner Child reminds us where we’ve been and what might be holding us back. We both had intense experiences during these meditations that we’d be happy to share with you in person. Another highlight was verbalizing to the group what we were grateful for, obstacles we were facing and wanted to overcome, and visions we wanted to manifest. We used white sage, crystals, and incense to help channel and raise the vibration in the room. Having that safe space to think, feel and talk about these important things felt special and we were all very grateful for it. The Yoga Forest is a relaxed, green, off-the-grid retreat space with amazing views, comfortable beds, delicious vegetarian food, yoga + meditation, and community. The staff was excellent and the facilities were nice, especially considering the sustainability aspect. No electricity (headlamps needed for reading and going to the bathroom after dark), compost toilets and permaculture farming. It’s smart yet back to basics living that everyone should experience at least once. Graciously, we took a suggestion from Jayā Saraswatī who led our sound ceremony. We planted a seed at The Yoga Forest so we’ll always remember where light exists and we can always go back to it. Eran is a well-trained and experienced practitioner of Ayurveda, Yoga & Meditation, combining in his therapy a vast knowledge to promote your healing and well-being. Gaining years of training, practice and experience in India, Australia and Israel, he brings a holistic and integral approach.